There is a growing awareness that the militarization of domestic police forces is the effective declaration of war against the civilian population in the United States. The local police force’s abusive militarized response to protesters in Ferguson, Missouri is sparking outrage around the world and even on capitol hill there is now a growing bipartisan criticism of what is going on as reported by Reuters. The military style local police forces in the United States are about as un-American and unconstitutional as you can get. This incident in Ferguson, Missouri that has been witnessed as brandishing military weapons of war against unarmed citizens is in all honesty simply treason against everything the Founding Fathers fought a revolution against. This is NOT what a “free democratic” nation does to its own people. In Britain for years the traditional policeman was unarmed. If someone had a gun, they called a special squad who was armed. When every policeman is armed, they are not all qualified mentally to exercise good judgement. They choaked one man to death recently and have shot an unarmed black teenager in Ferguson killing him. These tactics are uncalled for and it goes a long way to saying why all police should not be armed. People want to get rid of guns, well we have lunatics in the military shooting people on bases and former policemen also involved in such shoots. Being in the police force or the military is no guarantee that they know how to use such weapons or are not mentally defective. We have similar assumptions about Federal judges who are there for life as if they are above all human health issues. Such assumptions are just wrong. This is reminiscent of 1932 and the Bonus Army. 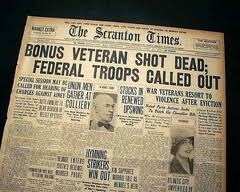 The calling out of the military against veterans including the use of tanks on the streets of the United States played a major role in the 1932 elections. Photos of the military on the streets shooting veterans who were there with their wives and children unarmed showed just how you can charge up police or military to fire on their own people. 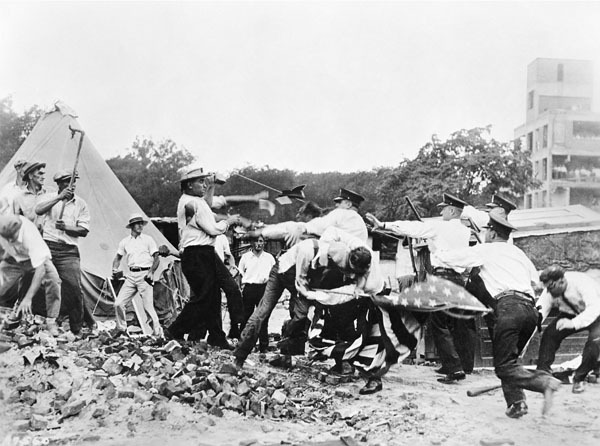 The even killed infants using gas against the bonus army that camped in Washington demanding what they were promised for fighting in World War I. 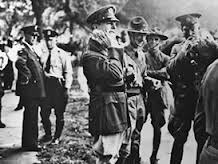 The assault on the veterans who defended the world in World War I and were treated like garbage moved the nation. That incident was the final straw that led the people to elect FDR with a majority in excess of 60%. This use of these very same tactics today is outrageous and quite frankly warrants criminal action against those in charge. This is not war games. But we have to realize, what you see in Ferguson is the attitude that has engulfed the entire civil police force throughout the nation. Top military generals led the assault against the veterans. 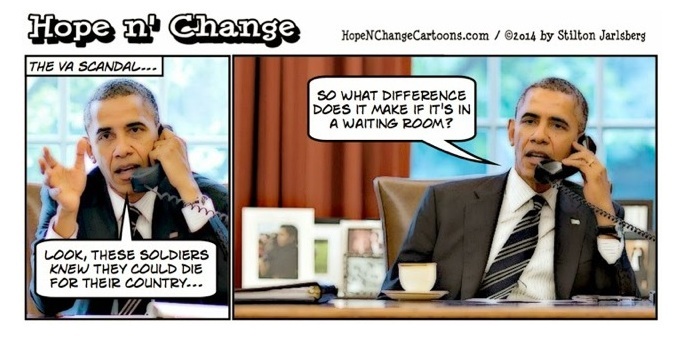 It was the lowest point in American military history. Because of this incident, when World War II came, Congress had to pass the GI bill to promise veterans would never be treated that way again. But when it comes to money, government never honors its word. Veterans have once again been treated with no respect yet they expect them to kill American citizens in any sort of protest. This amounts to murder and it is all about retaining power. This was the design of the military to prepare for civil unrest because the government WILL default on social welfare and social security not to mention confiscating pensions. This is in the future and the only reason Pentagon’s 1033 Program exists along with Home Land Security buying over 1700 tanks for domestic use. 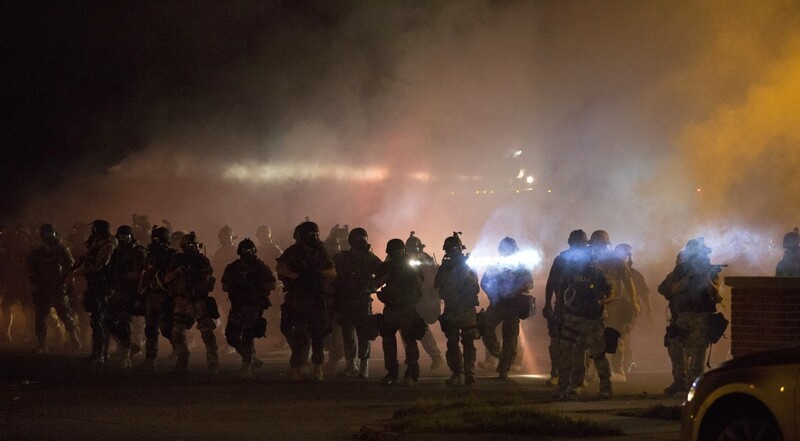 These people are preparing for war against the civilian population and Ferguson is just a preview of what lies ahead. « Are the ’60s Race Riots Coming Back after 43 years?